It often happens that groups of people would very much like to visit Wadi Rum but have little time. This programme is designed to offer small parties a real "desert experience" in an afternoon and an overnight. We would ask you to arrive reasonably early, say around 2 or 3 pm (the earlier you arrive, the more you would see). We then take you on out classic jeep tour or as much of it as we have time for, before driving you south, away from the normal tourist areas and into the "wild parts" of the desert. There we bivouac in a sheltered place and have a Bedouin supper, such as we cook for ourselves when we are out in the desert, followed by talk around the fire or perhaps a dance or two before sleeping out under the stars. This program is more difficult in the winter months, not just because it is cold, but because sunset comes early. But in the summer this is a marvellous desert experience. This program needs three guides, one to drive the jeep and two others to go ahead, prepare the camp and start supper which usually needs two to three hours to cook. It is therefore fairly expensive and we do not expect less than six people to take this up - we could do it for you if you really want to! We bring you back to the village in the morning at whatever time suits your program. 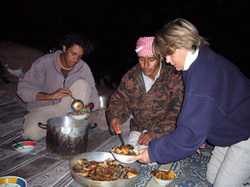 This price includes all food, guide services and equipment for sleeping in the desert. We would bring mattresses, pillows and blankets out to the selected site - which will not always be the same one.